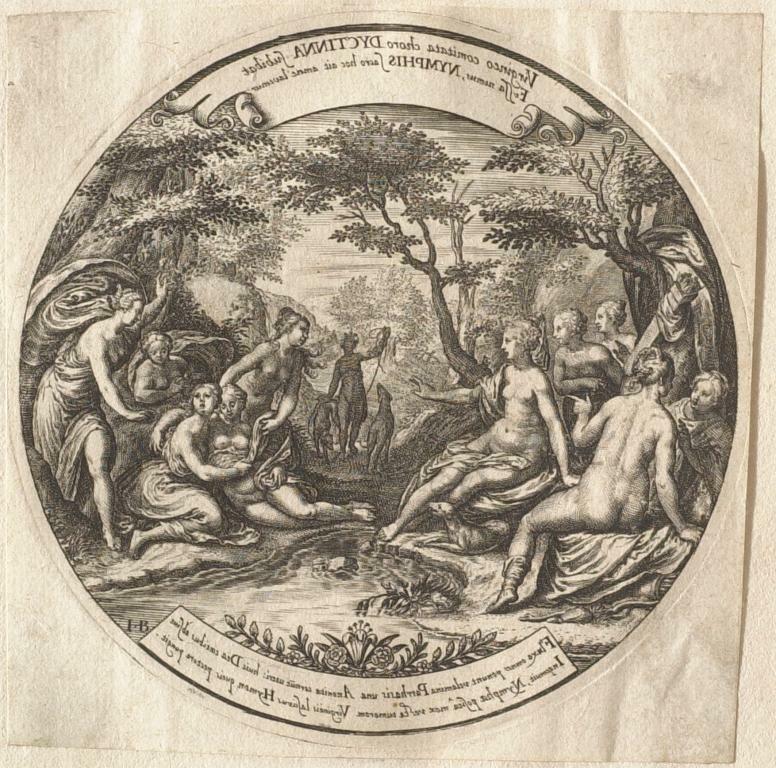 Johann Theodor de Bry after Paulus Moreelse, Diana Discovering Callisto's Pregnancy. Engraving on paper, ca. 1600. Sterling and Francine Clark Art Institute, Williamstown, Mass. During the 18th century, prints were for the first time systematically classified according to schools (i.e. countries) and individual artists. Much of the groundbreaking organizational work was done by Adam von Bartsch, an Austrian engraver who compiled scholarly catalogs that set the standard for print research. Between 1808 and 1821 he published Le Peintre-Graveur, which listed and described Flemish, Dutch, German, and Italian prints. A second edition, published from 1854 to 1870, included additions and corrections. Bartsch's print numbers are still used to identify specific prints in many catalogs and bibliographies. These editions included no indexing and no illustrations, however, and several projects were published during the 20th century to provide illustrations and indexing to the original Bartsch. Many other projects have been published to supplement Bartsch, especially by adding prints from countries not, or not well, represented. Bartsch, Adam von. Le Peintre-Graveur. Leipzig: J. A. Barth, 1854–70. The foundation work for the modern systematic study of Dutch, Flemish, German, and Italian painter-engravers through the 17th century. Although now outdated in some respects, for some lesser artists Bartsch is still the only, or most important, source. For each printmaker a general essay, descriptions of prints, and often an alphabetical list of words are given. For each print there is a description, dimensions in the French measurement system, and information on states and editions. Organization: 1) original prints, categorized iconographically by biblical subjects, saints, history and allegories, fictitious subjects, and portraits, 2) prints based on other artists' work, 3) doubtful attributions, 4) prints made upon artists' drawings but engraved by someone else. Bartsch, Adam von. The Illustrated Bartsch. Walter L. Strauss, general editor. New York: Abaris Books, 1978– . Multi-volume work, projected to be 175 volumes or more. When complete will provide illustrations for all 20,000 European prints listed in Bartsch, and will supplement, correct, and complete his material. For each volume of Bartsch there is at least one volume of illustrations ("Picture Atlas") that reproduces the prints listed in Bartsch, as well as a corresponding Commentary volume that provides detailed entries for each print, brief biographical sketches, reproductions of watermarks, chronological tables, and indices to subjects and people. Prints not cited by Bartsch are inserted in the correct iconographic sequence and given new numbers. The original Bartsch did not cover such areas as 15th-century German book illustration and 19th-century French printmaking, and TIB has therefore added many "supplement" volumes to fill in such gaps. Numbers on book spines are 1) the uniqueTIB volume number and 2) the volumes in the original Bartsch that it revises or illustrates. Standardization and consistency are not strong from volume to volume. Read the preface and keys to abbreviations for each volume when using TIB. ———. Le Peintre Graveur Illustré: Illustrations to Adam Bartsch's Le Peintre Graveur, vols. XII–XXI. University Park: Pennsylvania State University Press, 1971– . Intended as a visual reference to Bartsch's catalog, volumes XII–XXI, and so has retained Bartsch's order and numeration. Does not include prints unknown to Bartsch, or critical and explanatory notes, which are reserved for annotation volumes. ICONCLASS Indexes, Early German Prints. Leiden: Foleor, 1995– . Designed to give detailed iconographic access to the German prints of the later 15th and 16th centuries described by Bartsch in volumes 6 through 10 of Le Peintre-Graveur, and reproduced in volumes 8,9, and 23 of The Illustrated Bartsch. ICONCLASS categories are used to index works by iconographic subject matter; the key given in the Introduction explains how to find the works in Bartsch. Includes bibliographic references. ICONCLASS Indexes, Italian Prints. Doornspijk: Davaco, 1987– . Provides detailed iconographic access to Bartsch's Le Peintre-Graveur vols. 12 and 14 to 21, to prints in Hind's Early Italian Engraving, and to The Illustrated Bartsch. ICONCLASS categories are used to index works by iconographic subject matter; the key given in the Introduction explains how to find the works in Bartsch. Includes bibliographic references. ICONCLASS Indexes, Dutch Prints. Leiden: Foleor, 1994– . Eight volumes. Series gives detailed iconographic access to the Dutch prints reproduced in vols. 1–7 and 50–59 of The Illustrated Bartsch, and covered in Bartsch's Le Peintre-Graveur vols. 1–5. ICONCLASS categories are used to index works by iconographic subject matter; the key given in the Introduction explains how to find the works in Bartsch. Includes bibliographic references. Straten, Roelof van. Iconography, Indexing, ICONCLASS : A Handbook. Leiden: Foleor, 1994. Roelof van Straten explains his interpretation and use of the ICONOCLASS system as he used it in his indexes to Italian prints. Detailed directions assist researchers and indexers. ———. The Seventeenth Century : An Iconographic Index to A. Bartsch, Le Peintre-Graveur, vols. 19, 20, and 21. Doornspijk, The Netherlands: Davaco, 1990. Volume 8 of the ICONCLASS Indexes, Dutch Prints (see above). Iconographic index to volumes 4 and 5 of Bartsch and volumes 5, 6, and 7 of The Illustrated Bartsch. The Illustrated Bartsch is available on ARTstor. Under "Keyword Search" use the "Search a Collection" dropdown box to highlight "Illustrated Bartsch." Search by artist's name, subject, or any other keyword. Griffiths, Anthony. The Print in Stuart Britain, 1603–1689. London: British Museum Press, 1998. Exhibition catalog of the British Museum show in 1998. Arranged by period and engraver. Introduction gives historical background and an overview of print production in 17th-century Britain. Includes 214 works by 70 artists. Ackley, Clifford S. Printmaking in the Age of Rembrandt. Boston: Museum of Fine Arts, 1981. Catalog of the exhibition held at the Museum of Fine Arts in 1981, a comprehensive survey of Dutch printmaking in late 16th and 17th centuries that placed Rembrandt in the context of his contemporaries. Illustrations are the earliest and finest available impressions. Also includes a selection of prints from illustrated books, an important area of Dutch printmaking. An important essay by William Robinson discusses collecting and connoisseurship in 17th-century Northern Europe. A valuable resource for students of Dutch art and for print collectors. Hollstein, F.W.H. Dutch and Flemish Etchings, Engravings and Woodcuts, c.1400–1700. Amsterdam: Hertzberger, 1949–78. Hollstein, F.W.H. The New Hollstein: Dutch and Flemish Etchings, Engravings and Woodcuts, c.1400–1700. Ouderkerk aan den Ijssel, Belgium: 2005. "Every print of importance or of interest from the point of view of the history of art will be illustrated." Between the catalogs of the works are given complete lists of those prints which have been engraved after paintings and drawings by well-known artists. Numbers in brackets refer to Wurzbach's Niederlandisches Künstler-Lexikon (Reference N6931 A1 W9). Alphabetical by artist, with brief biographical notes. Dimensions are given, and all known states of each print. Clark Stacks NE663 H6 and NE663 H6 n.s. Riggs, Timothy, and Larry Silver. Graven Images: The Rise of Professional Printmakers in Antwerp and Haarlem, 1540–1640. Evanston, IL: Mary and Leigh Block Gallery, Northwestern University, 1993. Catalog for an exhibition at Mary and Leigh Block Gallery and the Ackland Art Museum in 1993. Explores "the flow of ideas between Italy and the North, the gathering of artists for the first time in a workshop environment, the development of the notion of reproducing a work of art to give that work greater visibility, the growth in the market for images of previously produced work, and the rise of truly great artists engaged in new aesthetic endeavors" through printmaking as it was practiced in the Netherlands during a period when engravers saw their main task to be the interpretation of the work of other artists. Baudicour, Prosper de. Le Peintre-Graveur Français Continué: ou Catalogue Raisonné des Estampes Gravées par les Peintres et les Dessinateurs de l'École Française nés dans le XVIIIe Siècle. Paris: Madame Bouchard-Huzard; Leipzig: R. Weigel, 1859–61. Supplement to Robert-Dumesnil, extending the catalog through the 18th century. Biographical sketches of the artists followed by detailed descriptions of their works. Preaud, Maxime, et.al. Dictionnaire des Editeurs d'Estampes a Paris sous l'Ancien Regime. Paris, Promodis: Cercle de la Librairie, 1987. Scholarly catalog of French print sellers and publishers from the 16th to the 18th century. Each entry contains references and notes. Reed, Sue Welsh, et al. French Prints from the Age of the Musketeers. Boston: Museum of Fine Arts, 1998. Exhibition catalog of a Museum of Fine Arts, Boston show that examined printmaking in France from 1610 to 1660, looking at 126 works by fifty artists. Includes essays on 17th-century intaglio printmaking in France, the print market in Paris from 1610 to 1660, Abraham Bosse, and Simon Vouet and his printmakers. Each print includes an illustration and discussion. Short biographies are given of each printmaker. Lengthy bibliography. Robert-Dumesnil, A.P.F. Le Peinture-Graveur Francais, ou Catalogue Raisonné des Estampes Gravées par les Peintres et les Dessinateurs de l'École Française: Ouvrage Faisant Suite au Peintre-Graveur de M. Bartsch. Paris: G. Warée, 1835–1871. The basic catalog of French printmaking. Arranged chronologically by printmaker. Each engraving fully described, with dimensions and various states differentiated. Volume 11 is a supplement, containing additions and corrections and a general index to the whole work. Geisberg, Max. The German Single-Leaf Woodcut, 1500–1550. Revised and edited by Walter L. Strauss. New York: Hacker Art Books, 1974. Strauss, Walter L. The German Single-Leaf Woodcut, 1550–1600: A Pictorial Catalogue. New York: Abaris Books, 1975. Alexander, Dorothy. The German Single-Leaf Woodcut, 1600–1700: A Pictorial Catalogue. New York: Abaris, 1977. Reproductions of and documentation on German single-leaf woodcuts during the respective time periods. Hollstein, F.W.H. German Engravings, Etchings, and Woodcuts, c. 1400–1700. Amsterdam: Hertzberger, 1954–78. Hollstein, F.W.H. The New Hollstein: German Engravings, Etchings, and Woodcuts, 1400–1700. Rotterdam: Sound & Vision Interactive, 1996- . Intends to reproduce "every print of importance or of interest from the point of view of the history of art," including prints of all kinds and calibre. New material, additions, gaps, and new discoveries of states are published (in the 1954-58 edition) for the first time, and a new classification system is used. Auction prices are given for "the more remarkable prints occurring in the auctions during the past fifty years." Organization is alphabetical order by artist. Brief biographical notes are given for each artist and provenance information for each print. Lists of reference works are included for each artist. Clark Stacks NE651 H6 and NE651 H6 n.s. Baudi de Vesme, Allessandro. Le Peintre-Graveur Italien: Ouvrage Faisant Suite au Pentre-Graveur de Bartsch. Milan: Ulrico Heupli, 1906. The basic work on late 16th- through 18th-century Italian engravers and engraving. Gives a biographical sketch and list of engravings for each artist. Supplements Bartsch. Index pp. 541–2. Bury, Michael. The Print in Italy, 1550–1620. London: British Museum Press, 2001. Shows the extensive range of prints produced in Italy between 1550 and 1620, and considers how and why they were made. Section 1 examines the operations and processes of printmaking; section 2 looks at the different kinds of people (designers, engravers, printers, print dealers) involved in the making of prints; section 3 looks at how printmaking operated in specific cities: Rome,Vienna, Bologna, and Siena. Hind, Arthur Magyar. Early Italian Engraving: A Critical Catalogue with Complete Reproductions of All the Prints Described. London: B. Quaritch, 1938–48. Selection of short articles on each artist, followed by a list of works with a description of various states, dimensions, collections, watermarks, inscriptions, and bibliographical references. Each volume includes a section on watermarks and a concordance to Bartsch, and an index of artists and subjects. Reed, Sue Welsh, and Richard Wallace. Italian Etchers of the Renaissance and Baroque. Boston: Museum of Fine Arts, 1989. Exhibition catalog of the 1989 show at the Museum of Fine Arts, Boston, "the first survey of the role of etching in Italy from about 1520 to 1700." Includes essays on the first two centuries of etching in Italy, characteristics of Italian paper, and a note on printing inks. The 151 prints by 79 artists each have an illustration and discussion, and each artist has a biographical sketch. Includes a bibliography. United States. National Gallery of Art. Early Italian Engravings from the National Gallery of Art. Washington, D.C.: National Gallery of Art, 1973. A monumental work, encompassing the range of 15th- and early 16th-century Italian engravings. Includes a representative survey of niello prints and woodcuts in the appendixes. Each section includes a critical essay on the artist and detailed entries. Well-illustrated.